The change to ICD-10 CM coding guidelines not only requires coders to apply greater specificity to their coding through a massive increase in codes available to choose from, the change requires payers to update their systems to accommodate the change. While coding managers work tirelessly to assure their coding is accurate and timely, technology is required to quickly identify inappropriate payer suspend reasons. 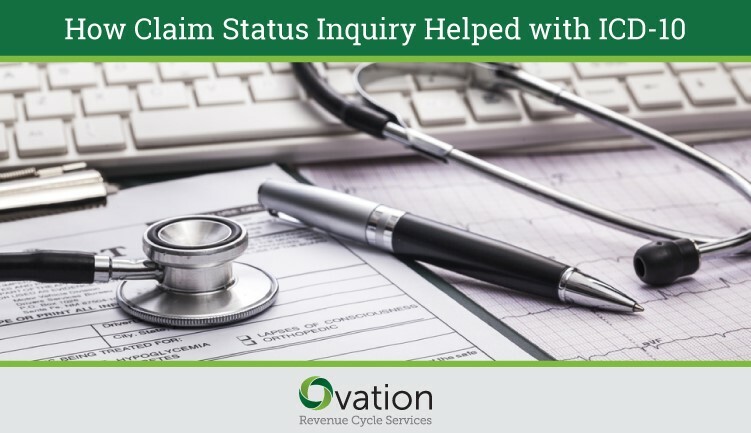 Ovation Revenue Cycle Services’ eClaim Status Inquiry (eCSI) uses technology to obtain claim status directly from payers and delivers proprietary payer payment and denial information directly to revenue cycle systems. This web-data extraction enables users to identify claims requiring manual effort while ignoring claims that do not. Unlike standard 277 EDI claim status transactions, eCSI provides additional content from payer websites that enables revenue cycle and coding managers to quickly identify and address internal as well as payer system issues. This is especially beneficial as payers continue to update their systems to accommodate and clarify the ICD-10 coding guidelines. Ovation Revenue Cycle Services’ eClaim Status Inquiry (eCSI) quickly identifies and quantifies issues to be addressed by both payers and providers providing much needed help with the ICD-10 guidelines transition. While much time and effort on the part of revenue cycle and coding leadership was devoted to preparing for the ICD-10 coding guidelines transition, there are still many issues that once identified will have to be addressed by both providers and payers. Very often more time is spent on finding the problem than correcting it. Newly created CMS suspense codes and identified over20 newly created Local Coverage Determination suspense codes as well as the suspense code to review for current and/or historical diagnosis. Many payers have not completely updated their denial reasons to accommodate the changes in ICD-10 guidelines that permit diagnosis codes in the primary position that were previously invalid. Claims denying due to inappropriate application of medical policy and rules related to age and gender, external injury codes, and some screening denials that are coded appropriately. While these issues will be resolved over time, providers need rapid identification and resolution. Ovation RCS’s eCSI quickly identifies issues and enables the managers to resolve their internal problems and work closely with payers to identify missed updates to their systems. eCSI supported provider/payer partnerships expedites issue resolution, claims paid timely and efficient claims management.